Encoding for the length of a string. Strings that are length-encoded must specify a length encoding scheme that gives the length of the string measured in code points. Definition at line 406 of file BinaryString.h. 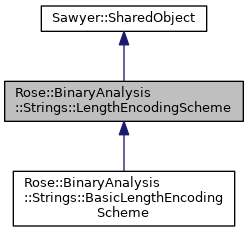 Shared ownership pointer to a LengthEncodingScheme. Definition at line 414 of file BinaryString.h. Encode a length into a sequence of octets. Definition at line 426 of file BinaryString.h. The decoder must be in the FINAL_STATE or COMPLETE_STATE, and upon return will be in the INITIAL_STATE.